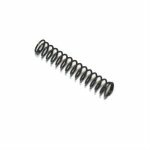 HK spring for ejector. Vital spare part; easily lost or damaged. These are surplus used in VG condition and perfect working order. German Army production made by HK. Correct for all HK weapons including: HK91/G3/PTR91, HK33/53/93, HK94/MP5, SP89/MP5K/SP5K.